Water Globe Ornament includes a clear glass globe, a rubber sealing gasket and bright gold plastic cap with gold hanging cord. We recommend sealing water globe to gasket using silicone adhesive(see below). IMPORTANT: Due to the variety of materials available for snow globe decoration we recommend testing figurines etc, for water compatibility before sealing globe. SIZE NOTE: Sizes shown are approximate due to slight variations which may occur during the Globe-Making process. Inside Top of Globe is 1-1/2". 1 12 24 48 Qty. Water Globe Ornament, 1-3/4" Dia. 1-3/4" Round Water Globe Ornament. 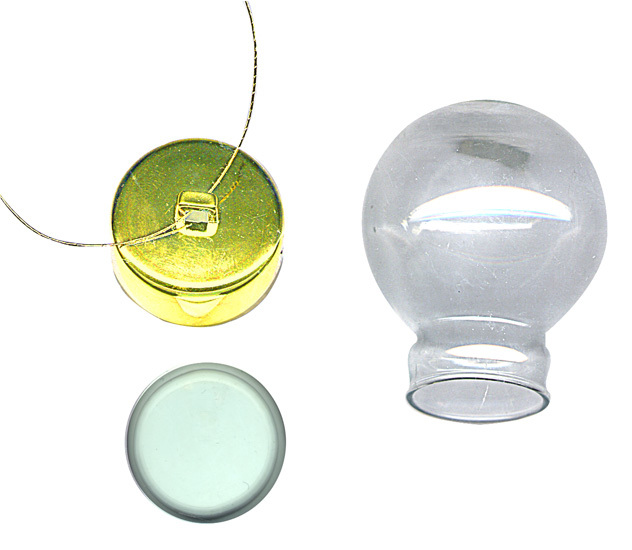 Includes glass globe, rubber water seal, bright gold plastic cap and gold string hanger.